I've noticed a distinct lack of discussion online about the Verizon-specific Treo 755p 1.08 ROM update ever since its release earlier this month. Whether it stems from that particular device's late arrival relative to its Sprint sibling or a lack of compelling reasons to apply the upgrade (not aided at all by Palm's cryptic list of the update's improvements on their support site), I decided to create this guide to help any overly-cautious achieving a smooth, flawless update process. After nearly two weeks since performing the update, I've been able to put this ROM through the paces and it's worked out quite well thus far (my impressions of the update can be found below). Everything went flawlessly for me and took less than the 45 minutes cautioned by Palm. If you follow Palm's instructions to the letter and keep my handful of suggestions in mind prior to beginning the update process, anyone who is on the fence about applying the update should have no worries about proceeding with the update. 1. 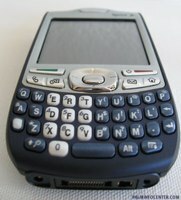 I did a full backup of my Treo 755p utilizing the latest version of the superb NVBackup utility. I then performed my usual Hotsync to my desktop PC. I also backed up the contents of my miniSDHC card to the hard drive on my PC using a standard USB card reader drive and a miniSD to fullsizse SD adapter. For what it's worth, I had also purged my Blazer cache, SMSs & VersaMail in/sent boxes prior to backing up my Treo with NVBackup and Hostyncing. Call me paranoid but I've seen too many disasters involving FrankenGarnet and NVFS over the years! 2. I then performed a hard rest of my 755p "just in case" and confirmed its operation status. 3. I then performed a full reformat of my miniSDHC card (Kingston 4GB class 6, a notoriously picky card, with FAT32 & 4k clusters) using Panasonic's superb SD formatter utility. I've had no issues at all using the Panasonic utility under both XP and Vista 32-bit and find it a nicer utility than the built-in formatter in Windows or the lame Card Info app in the Palm OS. 4. I used the card-based update routine, as per my standard procedure for performing all Palm OS ROM updates. This file is an 18.5MB download from Palm and is self-executing updater wrapped in a zip file. Palm also cautions not to use a microSD card in a miniSD adapter for performing this update and while I would think that a regular miniSD card WOULD be preferable, the realities of the flash memory marketplace have ensured that the retail available of "standard" miniSD cards is not what it once was. I do not see any pressing technical reason not to use a microSD card in an adapter if no other alternatives exist but, as always, proceed at your own risk. 5. I turned my Treo's radio off prior to launching the updater. This is ALWAYS a wise move for both stability and power-saving reasons. Besides, I generally find my device to be snappier and more stable when its radio is turned off. 6. The whole process took me a bit less than the 45 minutes advised by Palm. Be patient, as it takes QUITE a while to get going initially and will reset several times during the process. Don't take your 755p off the cradle/charger during this process. Overall this update routine was smoother and more simplified than past Palm updaters. 7. When restoring my device, I did both the standard Hotsync restore and a selective NVBackup restore and noted no problems using either method. Some TreoCentral forum users have suggested not restoring any Bluetooth-related files to avoid any potential pairing conflicts. 8. Additionally, I had to re-key in my registration codes for a handful of apps such as CorePlayer and my MobiTV login information was lost during the process. But for the most part everything survived the transition with no problems. I also took the opportunity to ensure that I was running the latest versions of all of my various apps and games and purged my miniSDHC card of a few old files and songs that I didn't need cluttering up my card. As always, remain patient, use plenty of caution and common sense, and keep your fingers crossed! This tutorial is provided for informational purposes only, use at your own risk. PalmInfocenter is not responsible for any loss of data, warranty or other issues as a result of this tutorial. Blazer, as always, remains the main culprit for lag with its infamous "white screen of near-death". Utilizing the latest version of Pocket Tunes Deluxe v4.07 on my freshly-updated 755p in comparison with the previous 1.06 755p, the updated ROM exhibited far less skipping while playing identical MP3s in the background. I actually tested this extensively on my flight back from vacation earlier this month. The VZW 755p ROM update had just been released but I wasn't going to install it until I was comfortably situated at home and had made sure the updater was devoid of any device-killing flaws, so I really put my 755p through the paces immediately prior to installing the update and noted any performance hiccups. Due to the various inherent limitations in the Garnet OS, some minor audio sputters and stutters are to be expected when doing background MP3 playback but for the most part, things just felt smoother doing them on the patched 755p. While the reduction in lag was far and away the major attraction of the 700p's 1.10 update last year, my 755p, inherently a better performer than any version of the 700p, has unfortunately become a tad MORE sluggish after this update. While my system stability is as good (if not better) than it was previously, switching from app to app and launching more complex games does take a bit longer than before. It's not a deal-breaker but it is noticeable whether running the 755p "clean" or with a full load of apps. In the recent CDMA Palm OS smartphone speed hierarchy, all versions of the Centro that I have used offer considerably improved performance over the 755p and all versions of the 755p offer improved performance over all ROM versions of the 700p. As far as the phone app goes, nothing major appears to have changed. I did not notice any differences in sound quality or call volume. The same lag when entering the phone app still exists, but I did notice speedier switching from the phone app to the main launcher screen compared to the previous ROM version. One small but noticeable improvement is this ROM update is a fairly substantial reduction in lag while on a call. For example, initiating a 3-way conference while on a call used to be an exercise in utter frustration with both the 700p and the 755p. Even looking up a contact while on a call is an overall smoother affair than with the older 1.06 ROM. The 755p still has a long way to go speed-wise to match the Centro but at least Palm managed to make some tangible improvements with this release. Nevertheless, this awkwardness is precisely one of the main reasons I keep my Treo relegated to its duty as a wireless PDA/e-mail machine and do all of my mission-critical phone calls on a "real" cell phone. Due to the usual aggravation of too much to do and not enough time, I have not been able to do much in the way of extended Bluetooth testing. However, I did have a bit of time a few nights ago to run through a handful of Bluetooth processes. I established a stable connection to my Gateway laptop running Windows Vista Home Premium 32-bit, to my trusty old Palm Wireless headset, to a Motorola car speakerphone kit and to my Motorola K1m cell phone. I was able to perform three Hotsyncs in a row via Bluetooth with my laptop and the latest Vista-compliant version of Palm Desktop. All of my available BT devices paired flawlessly and I didn't notice any major connection problems, crackling headset audio or any of the disappearing device pairings from before. Of course, I use my BT headset very infrequently with my Treo so I am not an expert in the matter. Still, my experiences mirror the reports online of a few small but noticeable Bluetooth improvements being made in this update. I did not check to see if the older version of Google Maps included in ROM was slightly updated with the new Verizon 1.08 ROM. DocsToGo is still at 8.02 after the update. At any rate, I immediately downloaded the 2.0.2.0 version of GMM and the latest version of Pocket Tunes into RAM to replace the ROM versions. The continued omission of the Google Maps Location APIs on all non-Centro Garnet devices, especially the relatively recent Palm OS flagship 755p is a giant blunder on Palm's part and typical of the company's disregard for supporting its legacy products or long-time user base. At the very least, an update to the Centro's Blazer 4.5.8 or the latest VersaMail 4.01 with its improved stability and background e-mail downloading would have been a fantastic addition to the Treo 755p's ROM. Any users in similar situations to me as far as reception should get off the fence and apply this update pronto! Prior to the 1.08 update, I experienced the dreaded "bleep bloop" coverage drop noise whenever I was in the ground floor of my office building and away from a door or window. My Treo would freeze up while it struggled to acquire the signal again. And even at home in certain upstairs areas, the phone would suddenly drop the signal then immediately reacquire it (all while rendering the Treo utterly useless). Surprisingly, after applying this update I am able to traverse the bowels of the building without hearing the drop tone and to-date I have only experienced one drop-out while at home. Even though I live and work in locations with strong Verizon EVDO coverage, both my older 700p and my 755p 1.06 had trouble hanging onto a weaker signal so I was immediately aware of the improvements in this department. This is by far the biggest positive improvement found in the update. Kudos to Palm for finally getting this device somewhere close to usable in fringe signal strength areas! Unfortunately, this improved reception comes at a cost, as I've noticed my battery draining ~10% faster than before on both a 2200mAh extended Seidio battery and a nearly-new Palm 1600mAh OEM battery. All of this is from informal testing, of course but still following my standard daily procedure: Unplugging the Treo at 8am and going it through a full work day and recharging at night while I sleep, with the screen usually set to ¾ brightness, IR/BT turned off, and VersaMail polling one POP account every hour on the hour from 8am-8pm. Well, I think that 755p owners everywhere can be rejoicing that they have not had to endure nearly as much drama in the first year of their devices' lives as the long-suffering Treo 700p owners from 2006 to 2007. et the Treo 755p truly epitomizes its status as the red-headed stepchild of Palm's lineup: Not old enough to be EOL'd yet not as new and deserving of attention like the popular Centro. The 755p has its own set of unique improvements over the Centro yet its substantially higher pricetag, dated software bundle, laggier performance and an effective end of support from Palm all conspire to make the 755p a poor choice for anyone other than true Palm OS power users. Despite the concerns outlined above, after living with the new 755p ROM version for nearly two weeks, I'm overall quite pleased with it and still would not trade it in for a Centro. Verizon 755p owners, long feeling cast in the shadow of Sprint users when it comes to the various Palm smartphone offerings, will be glad to see their device has received an update only a short half-year since its Verizon debut. The minor day-to-day performance improvements touted by Palm in this update essentially seem to consist of radio tweaks to improve telephone performance and reception, but for device enjoys solid, no-frills performance in most aspects, these improvements are better than none at all, especially with rumors of this device's discontinuation already swirling a few months ago. With this long, strange tale of the 700-series Garnet Treos about to conclude, I can give a moderately enthusiastic thumbs-up to this update. Now, Palm, bring on Nova with all haste! I enjoyed reading this article very much. I jumped right on the 1.08 update and wound up totally crashing my phone. Verizon didn't want to deal with it so they sent me a new phone right away ...I found two programs that conflict with the new rom ...T-Launcher and versa mail. I upgraded to the Centro version of versa mail and stopped using t-launcher and everything works fine ...I get the occasional reset when switching from applications, but I have come to expect that ...unfortunately. I am in agreement that the new rom is not much to write home about. Thanks for the compliment. Verizon, to their credit, are usually very good about not giving you the run-around and sending out replacement units. I went through 3 separate 700p's before I finally got one that worked rasonably well. I agree that the Centro-"only" version of VM is much improved over the 3.5.5 that is supposed to be used with the VZW 755p. VM 4 is slower, yes, but its a good bit more stable & the background email processing is a true time-saver. For me, if I didn't experience the small but appreciated signal strength improvements in fringe areas, I'd be really down on the 1.08 update due to the added battery drain. But, with the combination of a Seidio 2600mAh battery and never going more than 12-13 hours without recharging, I can deal with it. I don't know if anyone has noticed but there are file, date and size differences between the SD Card .ZIP file and the desktop self-extracter. Download both and check it out - not sure if that makes a difference or if there is any difference at all but it's very, very strange. Yup, I'm well aware of the zipe/exe differences, but since it was never really proved conclusively one way or another, I figure it's just best to stick with the tried & true (and "newer") SD-based method and go with it. Several months ago I updated a colleague's Sprint 755p with the 1.07 ROM using the Hotsync method and we had to us the Hostync method since he didn't have a spare miniSD card and I was had not yet purchaed my 755p. While it ultimately finished with no ill effects, we had to start & restart the process a few times and it it hung up during the unpacking stages. Sorry about rambling. That's what I get for trying to type a post & talk on the phone at the same time. -He didn't have a miniSD or a microSD card w/ miniSD adapter and didn't want to go out and buy one. So we did the wired, non-SD updater. I only had a fullsize SD card on me so I was of no help at the time. -It locked up approximately 1/3 of the way through the process. I had to hard reset the Treo 755p and try it again. It completed successfully the 2nd time but took longer than anticipated. -I then updated his wife's 755p that she got shortly afterwards. I used a card-based updater for hers and it went smoothly. -Then I did the SD-based update for my VZW 755p as noted above and it went flawlessly.